I like to have stock on hand for all my cooking, veggie, beef, chicken, you can do so much with it, but it can be really expensive and almost always contains WAY too much sodium. Many years ago, I thought it might be fun to make my own. Originally, I started making it on a whim. It was a cold fall day and it seemed like a nice thing to warm up the house and get it all smelling really good! That first recipe was super complicated and way back then I wasn’t quite sure what I would do with all the stock I made! Not only do I use fresh stock for almost everything, I really don’t use a recipe at all! It’s just the easiest thing to make and you can freeze it for later use. Besides, you get a nice amount of cooked chicken that you can use for Chicken pot pie or my personal favorite, Chicken Crepes. I’d really like to encourage you to make your own stocks. It does need a bit of time, so do it on a cold, rainy day, when you really don’t want to leave the house anyway. 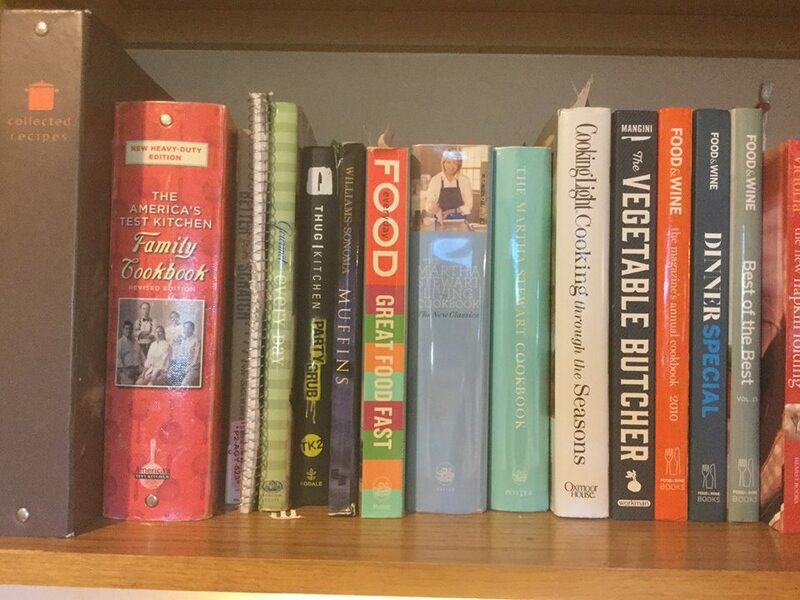 Here’s what I do most often, but you can find recipes online or just jazz it up yourself. Sometimes, I get a cut-up chicken if they are not pricey, because, honestly, why pay extra for something that you can do yourself? Now once I have my chicken in pieces, I fill a stockpot about 2/3 full of water and plop the chicken in! I simmer that baby for a while until the fat comes up to the top and I skim that, then I add, some carrots, with tops, some washed, unpeeled yellow onions, celery, parsnip, turnip, peppercorns, mushroom, fresh thyme, pretty much whatever I have that looks like it might go bad soon!! I also keep the tops of celery and other veggie scraps in a container in the freezer and I add that too! Then I simmer the whole thing for about an hour. I remove the chicken pieces and take all the meat off the bones, then I replace the bones and simmer for another hour. Then I strain it into a large bowl, pressing on the veggies to get all the good stuff out! Finally, I strain it again into smaller plastic containers for freezing. I put all the containers in the fridge overnight and scrape the solid fat that forms. Then I keep what I want out and freeze the rest! I used to only have to make chicken stock once or twice a year, but now I make it quite frequently. I suggest starting with Chicken or veggie stock, because it’s easy, but beef stock is awesome, so try that too!